At Top NoVa Orthodontics, we want each patient’s orthodontic experience to be amazing! We have created a Star Rewards Program to help positively reinforce healthy and fun habits for patients during their orthodontic treatment. 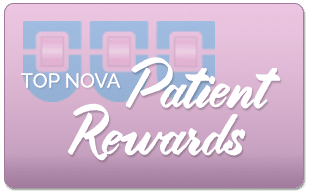 Patients can earn points for things like good oral hygiene, coming on time for their appointment, getting an “A” on their report card, for participating in our office contests and so much more! So next time you are in the office, ask one of our team members how you can be a part of our Star Rewards Program! Click here to download the printable Dental Certificate to earn points every time you get your teeth cleaned at the dentist.